The Great College of Krakow's Jagiellonian University. The 650-year-old Jagiellonian University moved in to the building at the corner of the Jagiellonska and Sw. Anny streets in 1400, when King Vladislav II Jagiello bought the house with funds his late wife, queen-saint Jadwiga, had earmarked for the renewal of Krakow’s alma mater. Thus the Grand College, or Collegium Maius, was born. The long and grand history of Krakow's Collegium Maius. The oldest college of the Polish oldest and best university, was rebuilt by the end of the 15th century as a splendid late-Gothic edifice around a vast courtyard with surrounding arcades and a well of 1517 in the center. Professors lived and worked upstairs, while lecturing downstairs. In the 1490s they had Copernicus among their students, and the astronomer that revolutionized entire European science remains the most illustrious of Krakow university’s graduates together with Pope John Paul II. Over centuries a whole university quarter has arisen around the Collegium Maius, while the old college became first the university library and then the university museum rich in unrivaled exhibits. The beautiful college courtyard is accessible free of charge daylong plus on odd evenings when it provides picturesque background for open-air theater or musical events. At 11 a.m., 1 p.m., and 3 p.m. (plus 9 a.m. and 5 p.m. in summer) the courtyard clock performs a little show with wooden figures of kings and famous professors parading to solemn music. The Museum of the Jagiellonian University in the Collegium Maius shows upstairs its splendid historic rooms with original furnishings, good collection of the old European art, unique science instruments, and varied memorabilia. The opening hours are from 10 a.m. to 3 p.m. on Mondays, Wednesdays, and Fridays, to 6 p.m. on Tuesdays and Thursdays, and to 2 p.m. on Saturdays. Admittance for individual visitors is free of charge on Tuesdays, from 3 p.m. to 6 p.m. Otherwise a single ticket costs 12 zloties (PLN). It's always advisable to book tickets to the university museum in advance via phone at (+48) 126631307. Downstairs the museum of the Collegium Maius organizes frequent temporary exhibitions. Plus there is a permanent educational show, 'The Whole Thing Is a Number', which demonstrates through 65 experiments that math permeates our daily lives - open on weekdays and Saturdays from 10 a.m. to 2 p.m. There is a gift shop and a cellar cafe on the premises. The Collegium Maius has facilities for the disabled. 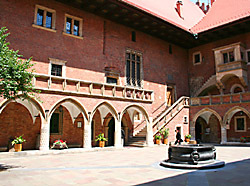 Watch online videos of the Collegium Maius in Krakow plus more information. Home to three dynasties of Poland's monarchs. Its stately halls and exquisite chambers are filled with priceless art, best period furniture and rare ancient objects. The collection of the 16th-century monumental Flemish tapestries is matchless. Poland's impressive national shrine shelters plenty of superb church art. Its giant bell of 1520 ranks with the world's largest. Most Polish kings and their family members are buried in the cathedral, its chapels and crypts. Krakow’s central Grand Square (Rynek Glowny), the largest plaza of medieval Europe and one of the world’s finest with its spectacular landmarks, has remained the hub of the city since the 13th century. The world's oldest shopping mall has been in business for 700 years. The present Renaissance edifice dates from 1555. Krakow's leaning tower was built by the end of the 13th century. 700-year-old main city gate with adjoining mighty walls and towers. Picturesque 17th-century church and monastery shelter numerous naturally mummified bodies in their crypts. The grandest of Krakow's seven historic synagogues. Poland’s oldest university with its 6,700 faculty and over 42,000 students is the country’s second largest institution of higher education and the best one. Poland's oldest library boasts 4.5 million volumes and its unique collection of medieval manuscripts and ancient books contains tens of thousands priceless items.